Data loss is an unpleasant event that usually occurs unexpectedly. Application files, database files and user documents can be lost after hardware failure or a virus attack. They can even can be accidentally deleted by users. Having a backup allows you to restore the entire system, or just the particular files and directories that were affected. In the context of virtualization, restoring the entire virtual machine (VM) can take a long time, depending on VM disk size, network speed, and hardware resources available. NAKIVO Backup & Replication provides data recovery features such as Instant File Recovery to Source and Instant Object Recovery for Microsoft Exchange, SQL or Active Directory. These features allow you to restore particular file system objects without having to first recover the entire VM. In addition to these features, starting from version 8.1 NAKIVO Backup & Replication includes the new Universal Object Recovery functionality, which provides even more options for recovering file system objects such as files and directories. Today’s blog post explores Universal Object Recovery, touching on how the feature works, its use cases, and its advantages. What Is Universal Object Recovery and When Can It Be Used? Recall that Instant File Recovery to Source and Instant Object Recovery allow you to select objects within a VM backup from the web interface of NAKIVO Backup & Replication for further recovery to the source virtual machine or a custom virtual machine. With the same feature, you can also download the files in question with a web browser or send them via email. Universal Object Recovery can perform similar operations – object recovery to a source machine and to a custom machine, including physical machines, without recovering the entire VM. In this case, the files can be copied from a backup even without the NAKIVO Backup & Replication web interface; you can use the interface of the operating system (OS) of the selected machine as the target mount location. An iSCSI initiator is enabled in the operating system of the machine to which you are recovering the files. At least one recovery point must exist. At least one Transporter must be discovered. The target machine can be accessed over network. The guest OS of the target machine is supported by NAKIVO Backup & Replication (these OS are listed in the system requirements). How Does Universal Object Recovery Work? 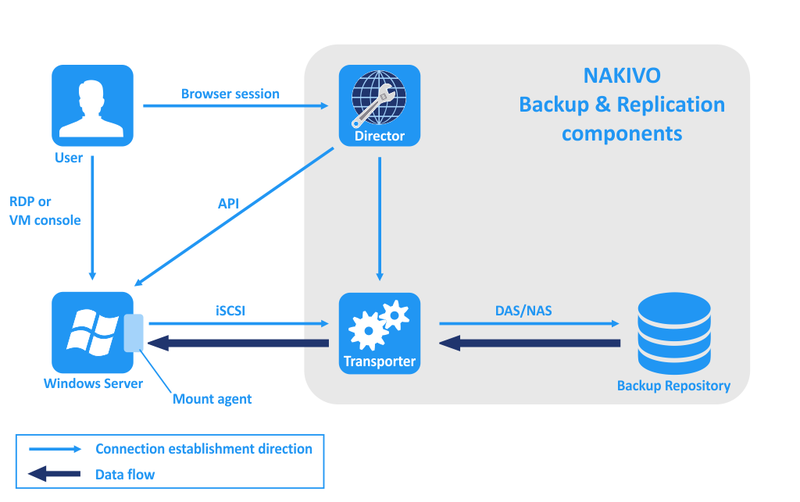 Once a user has specified recovery parameters in the web interface of NAKIVO Backup & Replication and started the recovery process, the Director connects to the target machine using the API and initiates deployment of a small mount agent on the target machine. 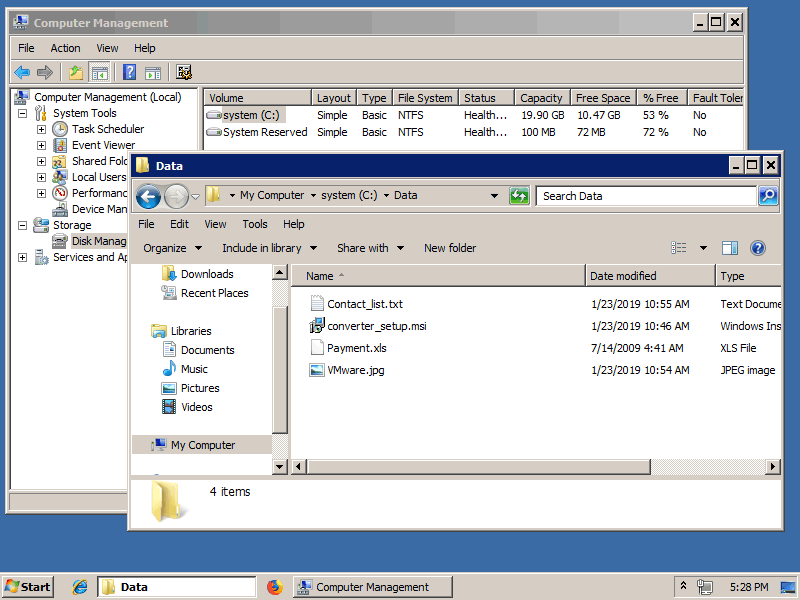 The mount agent uses built-in OS tools, including the iSCSI initiator, to mount disks and volumes via iSCSI protocol. 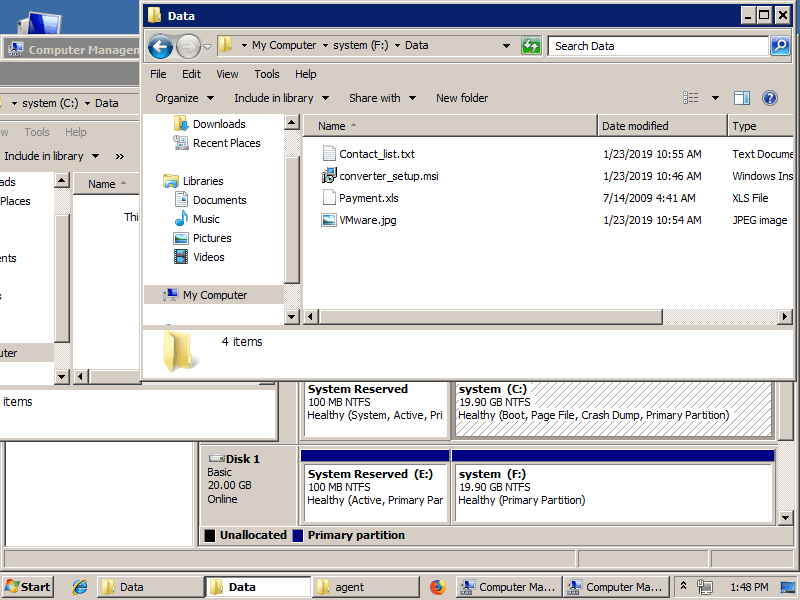 For mounting disks from a VM backup to the target machine, the mount agent connects to the Transporter and initiates the Universal Object Recovery session at the assigned Transporter. The Transporter is connected to a backup repository where the VM backup is stored. The Universal Object Recovery session can then be initiated on the target machine. The mount agent is smaller than 10 MB and is checked every 5 minutes to verify accessibility. The write cache is used as temporary data storage on the Transporter, allowing data to be read and written. The write cache is stored in a directory within the backup repository by default. It is created on a per-disk/per-volume basis and deleted when it is no longer needed. When data recovery is complete, the recovery job is closed and the session is terminated. The contents of the backup recovery point are then dismounted from the target machine, and the mount agent is removed. Let’s walk through how to run a Universal Object Recovery job using a simple example. Suppose you have a Windows VM with important files stored in C:\Data\ (see the screenshot below). The VM has one virtual disk with two partitions – a System Reserved partition, which is created by default for a boot manager, in addition to the C: partition used for storing the OS and other files. This VM is regularly backed up with NAKIVO Backup & Replication (the name of the relevant backup job is VMware backup job Win7 in these walkthrough screenshots). One day, you notice that some important files are missing in your C:\Data\ directory. NAKIVO Backup & Replication with Universal Object Recovery can help you to restore the lost files in this situation. Open your browser and log into the web interface of NAKIVO Backup & Replication. Click Recover > Universal Object Recovery. The Universal Object Recovery wizard is launched, which takes you through four steps. 1. Backup. Select your VM backup and select the appropriate recovery point. Choose a recovery point that includes the files you want to recover. Sometimes, file loss goes unnoticed for some time, with the last few recovery points being created after the files are gone. To ensure you can always roll back to a suitable point, use the Grandfather-Father-Son (GFS) retention scheme. Click Next to continue. 2. Disks. Select the virtual disks that previously held the files you want to recover. There is only one virtual disk in this example, but the feature works for multiple disks, too. Click Next. 3. Options. Select your recovery options – you should specify the IP address and credentials of the destination machine. Let’s recover files to the Ubuntu 18 Linux machine. This scenario may be useful when Windows machines are infected by viruses and are not functioning properly. Mount location. You can select any machine from your inventory, including VMware vSphere, Hyper-V, and Amazon EC2, from the drop-down menu. Location IP address. You can also manually enter the IP address of the destination machine to which your virtual disks should be mounted from the backup. If you select a VMware VM from the Mount Location dropdown menu and VMware Tools are installed on that machine, the IP address is defined automatically. Use custom SSH port. For security reasons, the SSH server on a Linux machine can be configured to listen on a custom port number (the default port number for SSH connection is 22). If your Linux machine is configured to use a custom port number for SSH connection, tick this checkbox and enter your custom port number. Don’t forget to disable this option once file recovery is completed – by commenting out this line with the # character, for example. Password. Enter the password for the user whose login you have specified. When all parameters are specified, click Test Connection. If everything is okay, click the Mount button. After that, your machine should pass the connection test and the disks should be mounted. Now you can see that virtual disk partitions have been mounted from a backup stored in one of NAKIVO Backup & Replication’s backup repositories to the sdc1 and sdc2 directories located in /opt/nakivo/agent/bh-mount. In this case, sdc2 represents the C: disk of the backed-up Windows VM. On the screenshot below, you can see contents of the Data directory. Recall from earlier that this is the directory that once stored the important files that were deleted somehow. Copy those files to a safe location in your Linux machine before finishing the Universal Object Recovery Job. If you want to recover files from your backup to a Windows machine, similarly, define the mount options for a Universal Object Recovery job, then click Test Connection. If everything is okay, click Mount to confirm and proceed with mounting the disks. If you see the warning that the “iSCSI Initiator” service is not running on the recovery server, you need to start the iSCSI service on your target Windows machine. Go to Control Panel > Administrative Tools and open the iSCSI initiator shortcut. Open CMD, then type services.msc, and check whether the iSCSI Initiator Service is running. After successful mounting, you can see the partitions mounted from the backup repository. Select the needed files and recover (copy) them to the appropriate location (see the screenshot below). The mount agent is deployed in C:\Program Files\NAKIVO Backup & Replication\agent on Windows systems. 4. Finish. The Activities tab displays all the jobs you run. You can click the Close button to close the Universal Object Recovery wizard. Select your Universal Object Recovery job from the Activities tab and click Stop when you have finished with the recovery. After that, the virtual disks mounted from backup repository are unmounted and the mount agent is deleted from the target system. Faster recovery. You don’t need to wait until the entire VM is recovered. Simply mount the virtual disks from a backup and restore the particular files that you need. Flexibility. You can restore lost files to any supported machine – not only their source machine. Lower Overhead. Recovery of selected files consumes less hardware resources than full recovery of the entire VM. With Universal Object Recovery, you can use your hardware resources such as CPU, memory, network bandwidth, and storage more rationally. Universal Object Recovery is a useful feature that provides multiple recovery options and helps you recover file system objects in a short time, to a source virtual machine or any other machine. After mounting disks from a backup repository to a target machine, you can recover files using the native operating system and application tools. This feature helps you save time and resources as well as providing greater flexibility. Today’s blog post has covered how Universal Object Recovery works, explored use cases, and walked through the software configuration to perform successful file recovery. Download NAKIVO Backup & Replication with Universal Object Recovery feature to try out this useful functionality in your own virtual environment.